G Athappan, V Ariyamuthu, V Rajamani. Phantom Tumor of the Lung. The Internet Journal of Cardiology. 2006 Volume 5 Number 1. A 45 year old, chronic smoker with a past history of hypertension was admitted with complaints of shortness of breath, orthopnea, and cough productive of pink frothy sputum. Examination revealed a blood pressure of 160/100 mmHg, pulse 112/min, tachypnea, jugular venous distention, bilateral pitting pedal edema, and extensive bilateral crackles over both lung fields. The findings were consistent with the diagnosis of acute pulmonary edema. A chest radiograph (Figure1) showed a sharply marginated biconvex opacity in the right interlobar fissure. 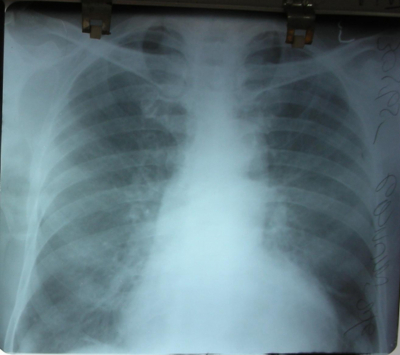 A repeat radiograph (Figure2) after successful treatment of the acute pulmonary edema showed complete resolution of the opacity consistent with the diagnosis of “pseudotumor” or “vanishing tumor” or “phantom tumor” of the lung. Pseudo tumors of the lung are transient collections of pleural fluid in the interlobar pulmonary fissure predominantly on the right, usually seen in congestive heart failure, renal failure or hypoalbuminemia by transudation from the pulmonary vasculature. The pathogenesis involves the adhesion and obliteration of the pleural space due to pleuritis that may be transient, thereby preventing the free accumulation of fluid. Recognition of this radiographic presentation is important because it may be the sole manifestation of heart failure; it also avoids unnecessary workup for a pulmonary malignancy. Managing the underlying condition leads to resolution of the pseudotumor. 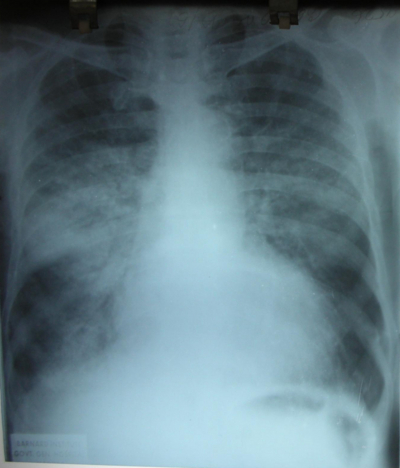 Figure 1: Chest Xray PA view on admission shows sharply marginated biconvex opacity in the right interlobar fissure.